A programme which equips students to become fully fledged qualified energy professionals towards international and local qualification status was initiated by the Limpopo Department of Economic Development, Environment and Tourism (LEDET), in association with the Association of Energy Engineers (AEE) training provider and Certification Coordinators the Energy Training Foundation (EnTF). This project aimed to uplift previously disadvantaged students from the Province of Limpopo with the objective to incorporate the skills acquired to implement the province’s Green Strategy. The EnTF was contracted to provide the necessary training and mentorship services to the students necessary for them to become skilled, employable and qualified in the areas of energy required for the Green Strategy. The ultimate aim of the students are to achieve international status as Certified Energy Manager (CEM®). CEM® qualification is a 40 year old Certification programme from the Certification Body the Association of Energy Engineers (AEE) headquartered in the USA. AEE qualifications are recognised in 105 countries around the world, as well as the Southern African region. Should this be achieved the students join a distinguished group of energy professionals globally, are listed on an international website, and become marketable for employment. To achieve CEM® in general, candidates attend theoretical class-based training, whereafter an examination has to be written and passed with 70%. Rewrites are possible. Once this passmark is achieved, application can be made for international certification Certification is awarded based on strict requirements of experience ranging from 3-10 years, the years of experience is dependent upon existing qualification levels. Due to the examination requirements being problem statements for which solutions need to be found, and the questions drawing from work experience more so than theory, an educational program was developed for the LDEDT students. The program is customised and aligned as much as possible to the varied levels of background, qualifications and skills of the candidates when they commenced the program. The program incorporates extended class-based training sessions with increased facilitation and practical workbook exercises, practice and homework. The audit templates and information that students were trained on were used during the site visits, and templates for reports were provided to compile findings, and teach students how to communicate findings to various levels of personnel in an organisation in order to secure funding for projects. All energy audit reports were reviewed with the mentors and the necessary guidance was given. During this phase, students had to not only complete the listed tasks but overcome the obstacles that are incumbent of the nature of intervening in the normal run of business in any organisation. In addition, the practical mentorship phase was accompanied with the opportunity to complete and submit a Portfolio of Evidence (PoE) for submission to the Energy Water SETA to obtain 10 credits towards a relevant qualification. This exercise is currently underway and embeds the practical mentorship phase even more. apply what they have learnt in the theoretical training sessions. 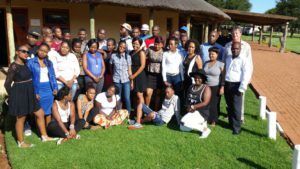 These students are now equipped to implement what they have learnt at any recommended organisation to gain vital workplace experience. Most students were subsequently placed within workplace environments, and one student has already completed a final ISO50001 Energy Management System audit successfully, with her hosting company and CEM® mentor at the company being awarded ISO Certification. One student has already successfully passed the CEM® examination and has already accepted permanent employment in the energy industry where he is busy gaining sufficient work experience in order to successfully apply for AEE CEM Certification. Students currently undergoing the workplace experience have been encouraged the implement the ISO/SANS 50001:2011 Energy Management System so that any energy initiatives implemented, after students have presented opportunities through their audit findings, may be sustained. Most importantly, the technical aspects required to understand the concept questions in the CEM® examination and ensure the success of long term energy management within any workplace, forms part of the experience gained. Most students have been placed under current CEM® mentors whom have demonstrated competence in mentoring within the technical and engineering fields. It is anticipated, that the students will achieve competence in various areas of energy skills, either through the EWSETA, and in some instances in the holistic requirements of being a full CEM® within a three year period from taking the first training session. The AEE qualifications, such as CEM®, enables South African’s to obtain a globally transferrable and usable qualification thereby enhancing career development and marketability of skills. Students on the program that are able to pass the examination within three years of attending the training sessions, have the potential to become highly skilled through the knowledge, practical work experience and guidance received on this program and are set to make a recognisable difference in the industry in South Africa, and for the Province of Limpopo. The CEM® qualification is asked for by name, and recognised as a required qualification in the industry by most major corporations and human resource departments and companies for employment in the energy industry as energy managers, energy engineers, energy auditors, measurement and verification practitioners and related industries. Companies with CEM’s, CEA’s and CMVP’s in their employ are invited to apply to mentor such a student for the next round of placements. Students will receive a stipend payment monthly for a year whilst working for the mentoring company paid for by LEDET. The training and mentorship is managed by the EnTF mentor with continuous guidance provided to students and company mentors throughout the placement period. Placements are currently considered for the year 1 August 2017 to 31 July 2018. AEE Professionals will earn a renewal credit for each year of mentorship provided to a student. More than one student may be placed per organisation. To express interest in mentoring a student email thieda@entf.co.za for a link to complete the short application form. For questions on the program contact the Training Manager Yolanda de Lange on 084 622 4770 or yolanda@entf.co.za.